Why Is The World's Greatest Fighter Playing Medal Of Honor In 2015? Anderson Silva is arguably the greatest mixed martial artist who ever lived. He has a highlight reel of knockouts and does things that most fighters find incomprehensible. But right now he isn’t fighting. He’s recording himself playing Medal of Honor: Warfighter on his mobile phone and tweeting it. Just for context: Anderson Silva has seven million followers. His twitter account, like most celebrity accounts, tends to be fairly moderated. Usually videos of him thanking fans, or training, stuff like that. More context: Anderson Silva is currently a hot news ticket. In January he tested positive for a number of different performance enhancing drugs and is currently in the process of fighting the Nevada Athletic commission on the charges. At the moment every single tweet he makes is being analysed and discussed. And here he is: playing Medal of Honor: Warfighter. Recording the cut-scenes. On his mobile phone. And then uploading them to twitter. Without a single comment. Literally on some of the videos, if you look closely enough, you can see his reflection on the TV. I’m completely baffled. What the hell is going on here? Why video games? And why — of all the games — Medal of Honor: Warfighter? A sub-par shooter released in 2012! 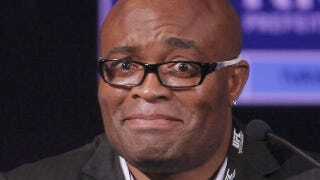 Anderson Silva is probably the most highly paid mixed martial artist of all time. He’s still playing Medal of Honor: Warfighter? Anderson is known for enjoying his video games. He’s also a big fan of paintball and reportedly takes it pretty seriously. But that doesn’t explain this! Is he going through his pile of shame? Does he just really, really like Medal of Honor: Warfighter? Is he just trolling everyone? It’s possible. Anderson Silva has famously ‘trolled’ both his opponents and the media at different points in his career. That’s the only reasonable explanation here.